It’s Freezer Meal Recipe Cooking Day! Hostess has pantry food set out and easy to access. If she is really on the ball she can label and divide out all of the pantry items ahead of time. Have husband taking care of children, or better yet, have hubby take kids somewhere else for a few hours! We usually order a take-and-bake pizza to eat part way through the evening. Plan for 3-6 hours. Time will depend on the number of meals, difficulty of meals, and how much prep work was assigned out. Cooking day gets faster the more you do it and the more familiar you get with the recipes. 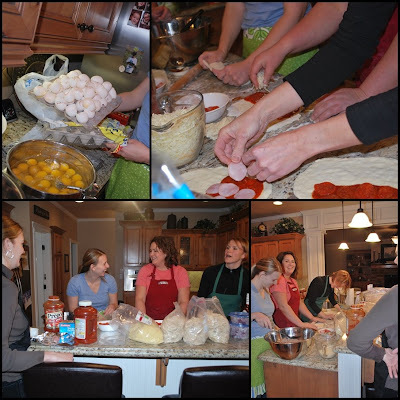 Meals like Calzones and Pizza are done by the individuals to make sure they include what the person’s family likes. We always save these for the end. Make sure to get all the air out when sealing bags or use a FoodSaver for maximum freshness. All of the food expense including the take and bake pizza is added up and divided by 6 or the number of members in the group. Everyone pays equally each time. For 15 meals each person usually pays less than $100. Don’t Forget the Fridge List! The co-shopper emails the list out to everyone. Here is an example of a fridge list. night, but are provided by the group. Things that store well on the shelf or in the fridge. We try to include most everything needed so that you are ready to make a meal at anytime, with out having to do any additional shopping. Be sure to check out our Freezer Recipe Database. ps – Cathy here. May I just say that we have sooo much fun when we get together and do our freezer cooking? I LOVE it! 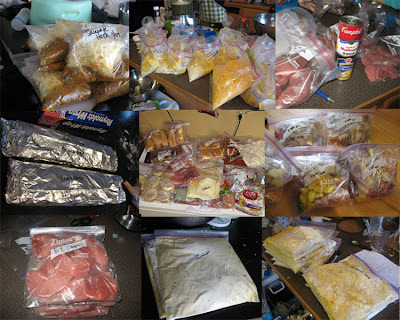 Here are a few pix from my very first freezer cooking experience. Do we look like we’re having fun? Hi Melissa! It depends on the recipes. Some meals you just throw the raw chicken and some marinade in a bag and it’s all ready to throw in the crockpot on the day you’re going to eat it. Other meals have you cook up all the meat and assemble everything (like a lasagna for example) and then you’re basically reheating the day you’re going to heat it. Each recipe will have individual instructions.